Think of candle magick as a powerful tool in your manifesting tool belt. It’s all about setting intentions and visualizing the outcome. 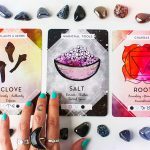 Candle magick can help you do both of these things by collecting the right tools and slowing down to allow time to really embody what you’re trying to bring to life. I shared in a previous post the basics for getting started with candle magick. If you missed that one you can read it here. Here I’m sharing four candle magick spells to get you started on your candle journey. 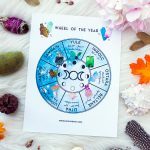 Click here to receive your free printable cards for each of these spells. Don’t hesitate to modify and make these spells your own. 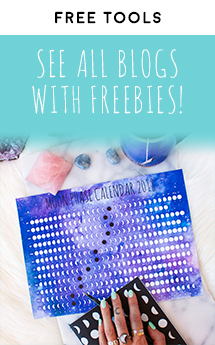 Once you’ve tried a couple you’ll feel confident to start creating your own. 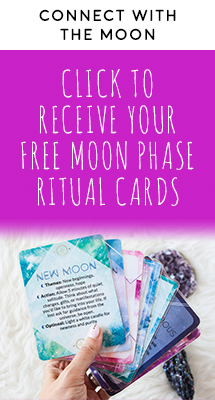 Whether you’re looking for some extra spending money or a serious pay raise this spell can help. Tiger eye, citrine, and green aventurine. Use one or all of these stones, whatever you have access to will work. 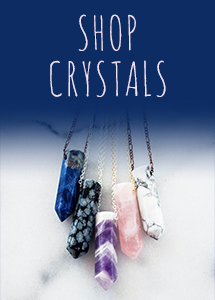 All of these stones are also available in our crystal kit here. SPELL STEPS: Start by cleansing all of your items for the spell. This can be done by wafting sage smoke over them or visualizing white light cleansing them. For this spell, you’ll be carving the Fehu Rune into your candle. Fehu is a powerful symbol of abundance. If you’d prefer to carve a specific dollar amount or item you’re hoping to attain you could carve this into the candle too. Anoint your candle with the oil of your choice. As you carve and anoint your candle visualize your abundance goal. 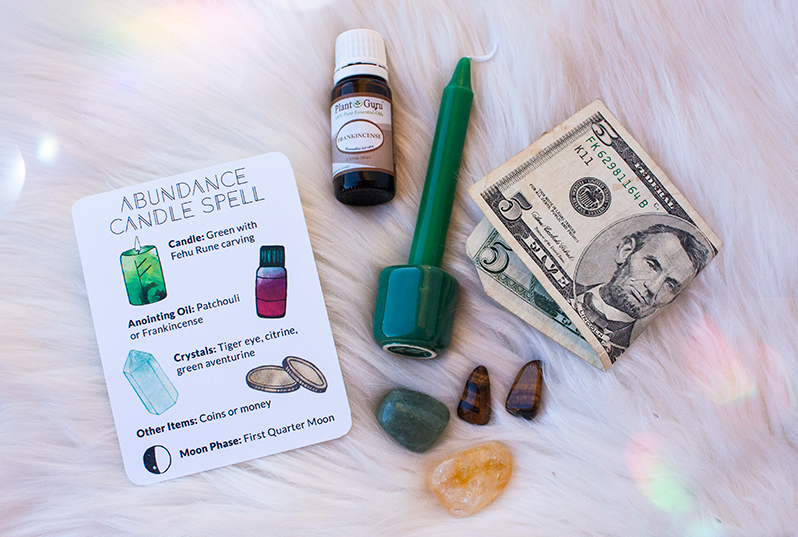 Arrange your crystals, money, and candle in a place that you can leave it up for a few nights. Light your candle and meditate on the flame. Visualize your abundance goal clearly, imagine yourself reaching your goal and what it would feel like to attain it. You can continue this until the entire candle burns or snuff out the candle and continue the same ritual each night until the candle has burned completely. Finding love started with loving yourself. When you love yourself intensely you’ll become a magnet for love. Rose quartz and a garnet. 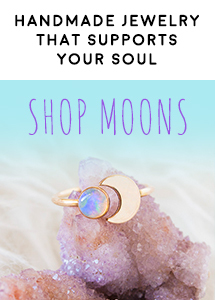 Garnet can be harder and more expensive to come by if rose quartz is the only stone available to you that’s ok. SPELL STEPS: Start by cleansing all of your items for the spell. This can be done by wafting sage smoke over them or visualizing white light cleansing them. For this spell, you’ll be carving a heart symbol into your candle. Anoint your candle with the oil of choice. As you carve and anoint your candle visualize a haze of pink and green light forming around you. Arrange your crystals, other items, and candle. Light your candle and look into your mirror. Begin to say loving affirmations about yourself like: I love myself. I am beautiful. My body is perfect just as it is. I am grateful for my beautiful body. Once you’re finished continue to meditate in front of the flame visualizing the loving pink and green light around you. Continue this until your candle burns completely or snuff out your candle and return to this ritual on the next night until your candle is completely burned. Keep your items up as a loving reminder as long as you’d like. 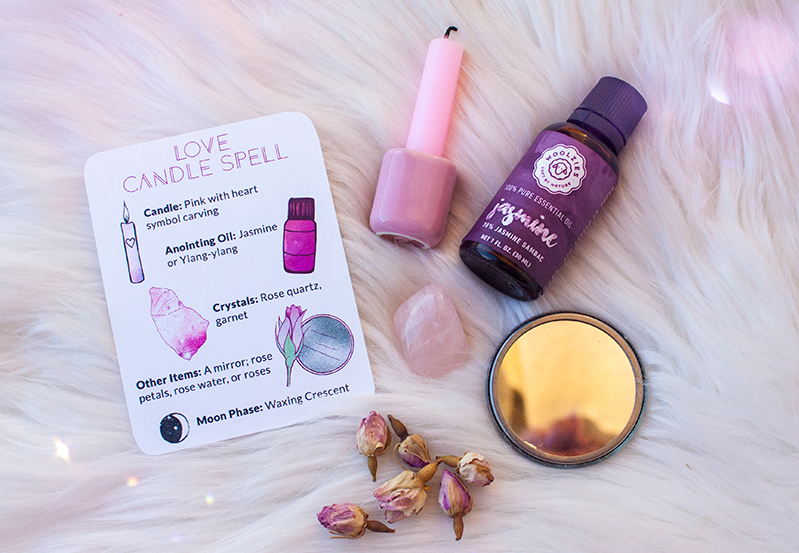 This love spell was modified from a previous blog post, The Only Three Love Spells You’ll Ever Need. 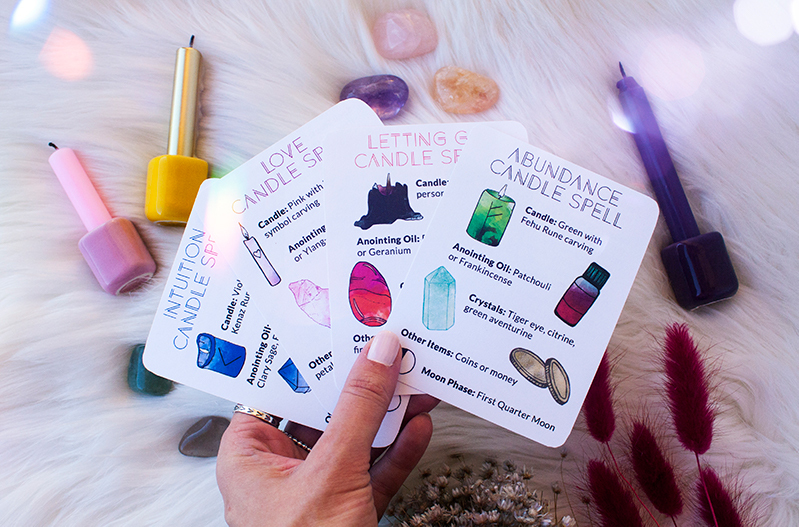 Click here to check out the other two love spells! 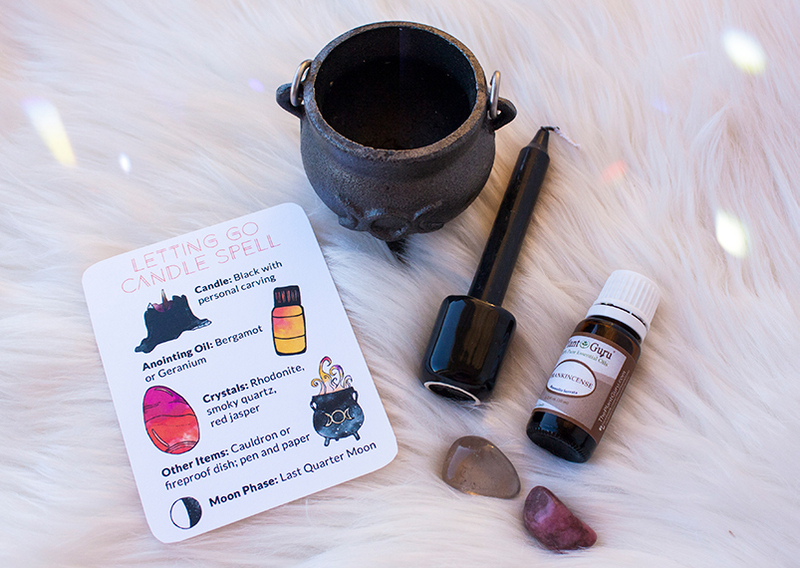 Whether you need help letting go of a person, habit, or item this candle magick spell can help. Rhodonite, smoky quartz, and red jasper. For this spell, each stone does serve a very specific purpose so it is best to have all of them. SPELL STEPS: Start by cleansing all of your items for the spell. This can be done by wafting sage smoke over them or visualizing white light cleansing them. 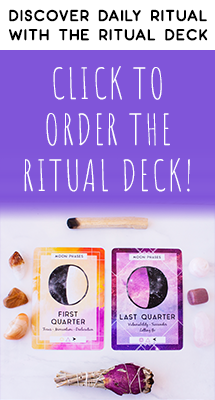 For this spell, you’ll be carving the name of the person, habit, or item you’re trying to let go of or release. Anoint your candle with the oil of your choice. As you carve and anoint your candle visualize yourself letting go with ease and grace. Arrange your crystals, other items, and light your candle. Write what you’re letting go of on a small piece of piece of paper, light it with the candle, and place it in the cauldron or fireproof dish. Meditate on the flame of the candle as you visualize what you want to let go of and how it will feel. Ask aloud to be released from what it is you’d like to let go of. 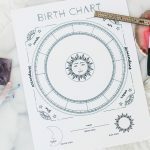 You can continue this until the entire candle burns or snuff out the candle and continue the same ritual each night until the candle has burned completely. 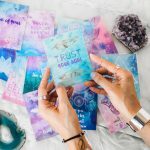 Do you have a burning question that you need guidance on or feel like your connection to spirit needs refreshing? Try this spell. 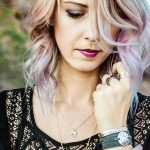 Amethyst, selenite, and labradorite. Use one or all of these stones, whatever you have access to will work. SPELL STEPS: Start by cleansing all of your items for the spell. This can be done by wafting sage smoke over them or visualizing white light cleansing them. For this spell, you’ll be carving the Kenaz Rune into your candle. 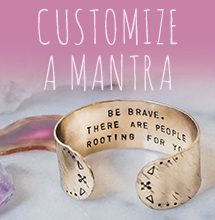 Kenaz is a powerful symbol for intuition and clarity. Anoint your candle with the oil of your choice. 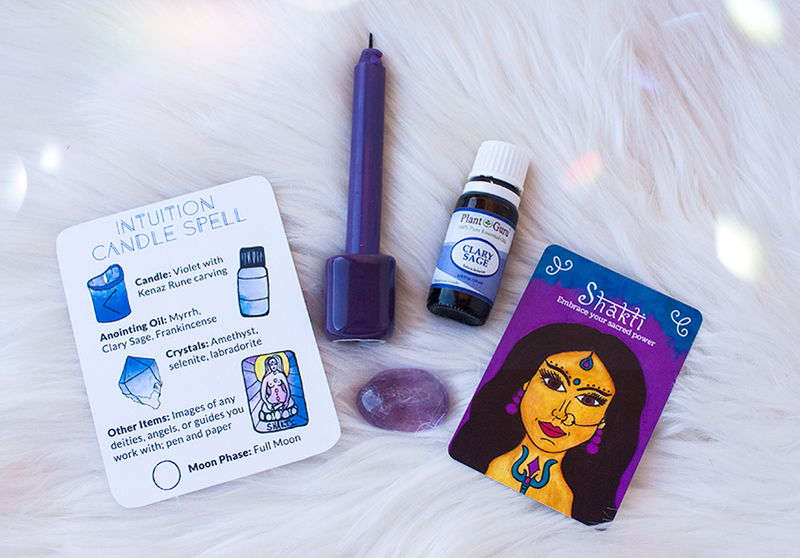 As you carve and anoint your candle visualize your third eye (between your eyebrows) glowing and radiating purple as your third eye opens. Arrange your crystals, any other items, and light your candle. If you have a specific question you need clarity on write it on the piece of paper, fold it up, and place it under the candle. Gaze at the candle and any images you have set out and imagine your third eye opening to become a vessel for new information from The Universe or from your guides. This exercise is more about opening your third eye and less about forcing answers. Your answers may come now or later. You can continue this until the entire candle burns or snuff out the candle and continue the same ritual each night until the candle has burned completely. 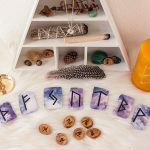 Don’t forget to grab your free printable with all four of these spells here. 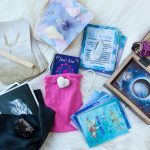 You have all of the tools you need to dive into candle magick!